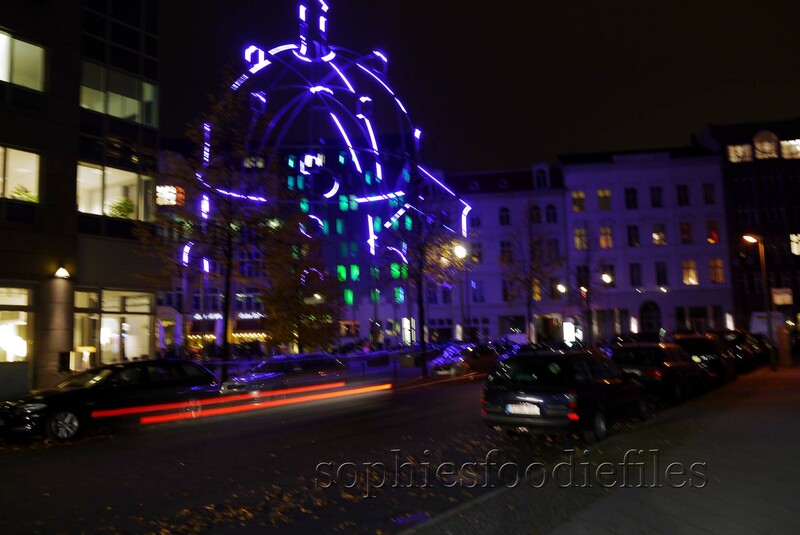 Travelling Sophie: Berlin part 2! Now, that you read about Travelling Sophie: Berlin part 1 it is time to move up to part 2. What do you think? Here we go! 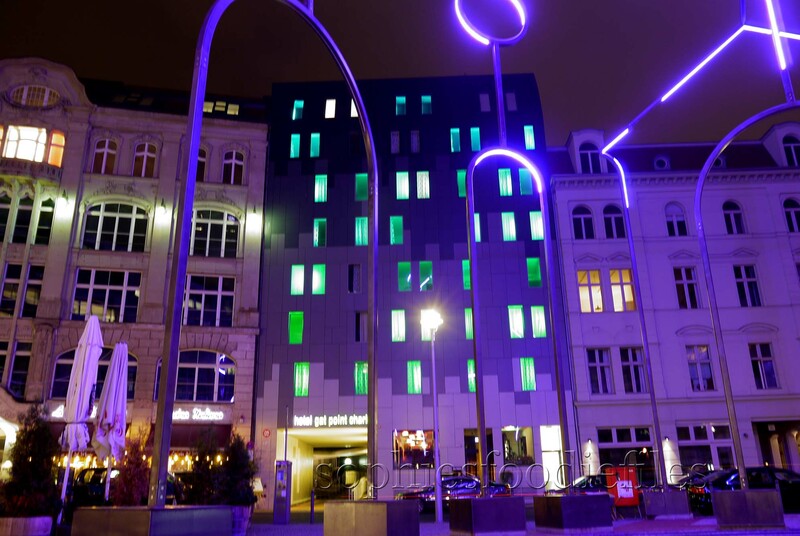 You already knew that we stayed in a lovely 3 star modern hotel, called Hotel Gat Point Charlie, in the old historic part of this wonderful city, in Mitte. I told you all about it, in an earlier post, click here! Very cool & modern too! The front of our hotel at night! Memoria Urbana Berlin! Behind it, our hotel. 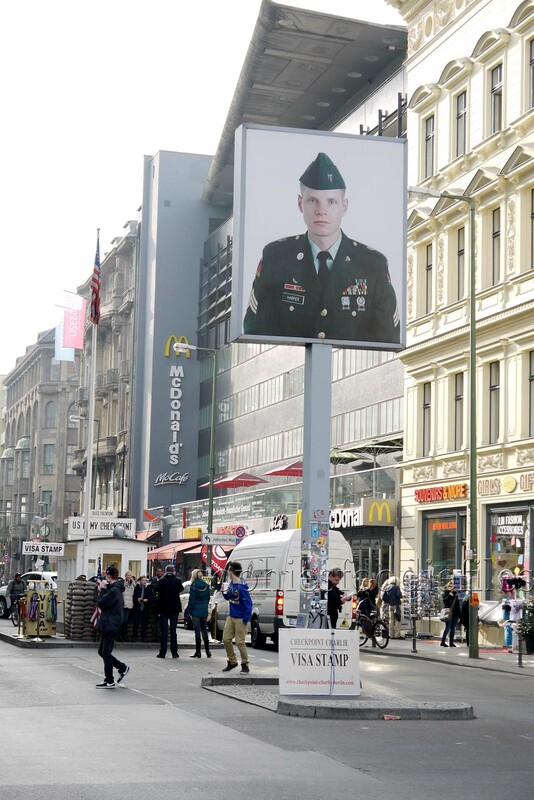 Then, later we went to Checkpoint Charlie, that was only 200 meters from our hotel. We read, outside on the street, all about the difficulties Berlin had to stood through, in time. In the history of Berlin, building the Wall, wasn’t the 1st crisis the Berliners went through. You could read all about it there. There is also a museum but we didn’t do that. We went to another museum after this. Was the name given by the Western Allies to the best-known Berlin Wall crossing point between East Berlin and West Berlin during the Cold War. GDR leader Walter Ulbricht agitated and manoeuvred to get the Soviet Union‘s permission for the construction of the Berlin Wall in 1961 to stop Eastern Bloc emigration westward through the Soviet border system, preventing escape across the city sector border from East Berlin to West Berlin. 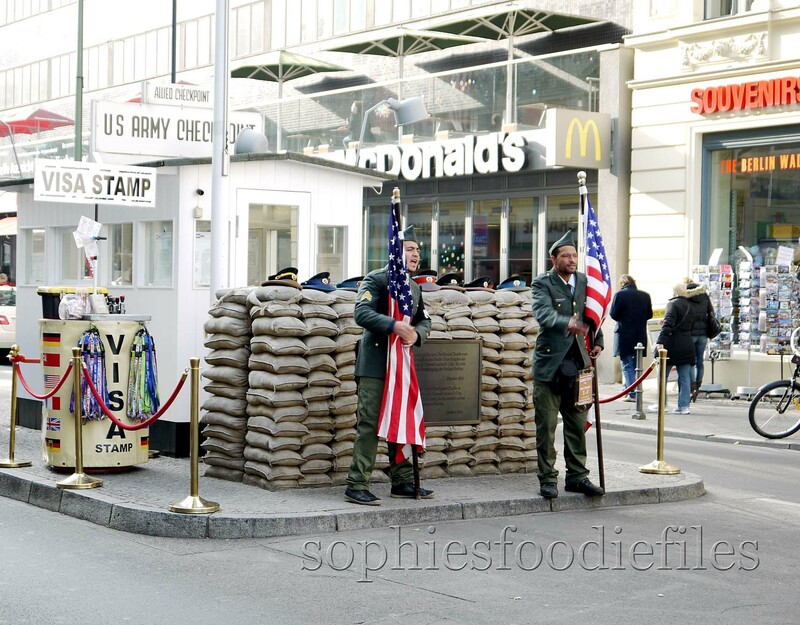 Checkpoint Charlie became a symbol of the Cold War, representing the separation of east and west. Soviet and American tanks briefly faced each other at the place during the Berlin Crisis of 1961. After the dissolution of the Eastern Bloc and the reunification of Germany, the building at Checkpoint Charlie became a tourist attraction. 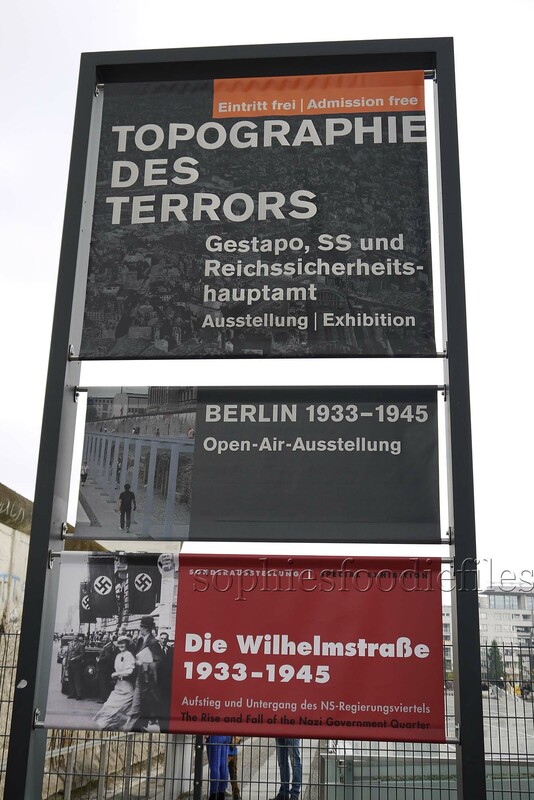 Then, we went to the museum: Topographie of terror, a museum dedicated to Hitler, the SS , Gestapo & Reich Security too. A very interesting museum: free too! It is about how Hitler got the only Power in his Third Reich in Germany & how the SS & the Gestapo developed into what these organisations became & what they did. It was very touching too. I took pics inside but will not show them to you. You just must go & see what horrible actions this evil man did. But you learn a lot. The admission was free. It is an impressive site, with an outdoor exhibition too. The outdoor exhibition “Berlin 1933–1945: Between Propaganda and Terror” addresses National Socialist policy in Berlin and its consequences for the city and its population. Adresse: Niederkirchnerstraße 8, 10963 Berlin. Open? Daily from 10 AM till 8 PM. Closed on Dec 24th, 31st, Jan 1st. Nearest U-bahn: U-Bahnhof Potsdamer Platz oder Kochstraße. We were 2 hours there. After resting in a café, we went searching for a cool place to eat. 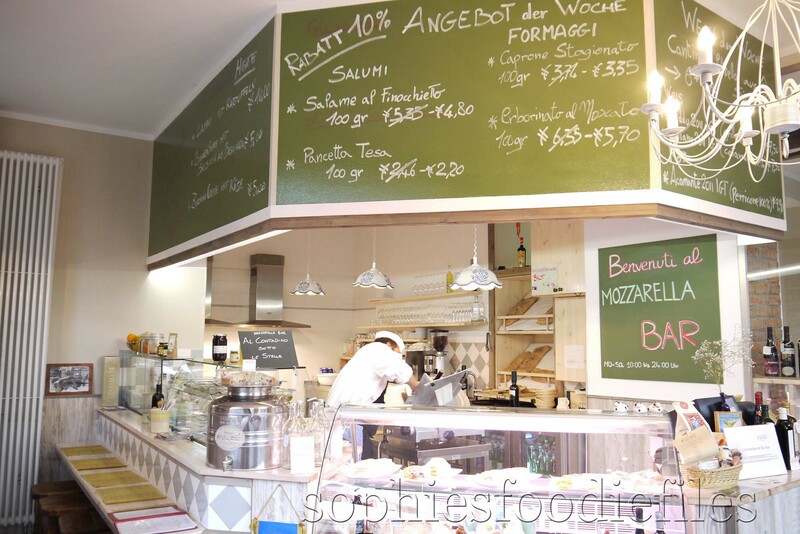 We searched a lot & then, finally, we found this little gem: The only mozzarella bar & botega,in Berlin, called Al Contadino sotto Le Stelle, August Straße 34, 10119 Berlin . It is a very cosy mozzarella bar. It has been open since June 2012. Peter & I were very hungry. Now, what to choose? We could eat anything from the menu or from the menu card solo or combine things together. Peter & I started each with a good glass of red wine. I had a Don Aldo wine, a more old one: very rich & very cherry like, there was also Cabernet Sauvignon in it. It was lovely. Peter had another red wine: Marchese Rosso D.O.P. 2010. ( It contained: Sangiovese 60%, Malvasia nera 30%, Cabernet Sauvignon 10%). His wine was a bit younger but also very fragrant, had a good body & depth. Enjoying a good glass of red wine with my loved one, Peter! We twice ordered the lentil & vegetable soup with an Italian sausage in it. Before we received our soups, we got some lovely fresh Italian bread slices, some good fruity olive oil, some green olives & a few pieces of home-made foccacia. It tasted lovely. So fresh & appetizing too! Halfway through my tasty soup, scented with fresh rosemary! We were enjoying ourselves over here, sitting at the window, watching the world go by,…It was lovely. There was also a cosy atmosphere. We stayed there for 3 hours! It is a great alternative & cozy place to dine & wine. 🙂 It is not too pricy too. You have good quality here. After the soup, we were still a bit hungry so we looked at the menu. We took advice from our friendly waiter. I ordered a ball of fresh buffalo mozzarella, 250 gr! Just for me! You could choose: a powerful or a milder mozzarella. I chose a milder one. I ordered extra, the Mortadella al Tartufe, finely sliced with it. This is finely sliced Mortadella with black truffle pieces in it. 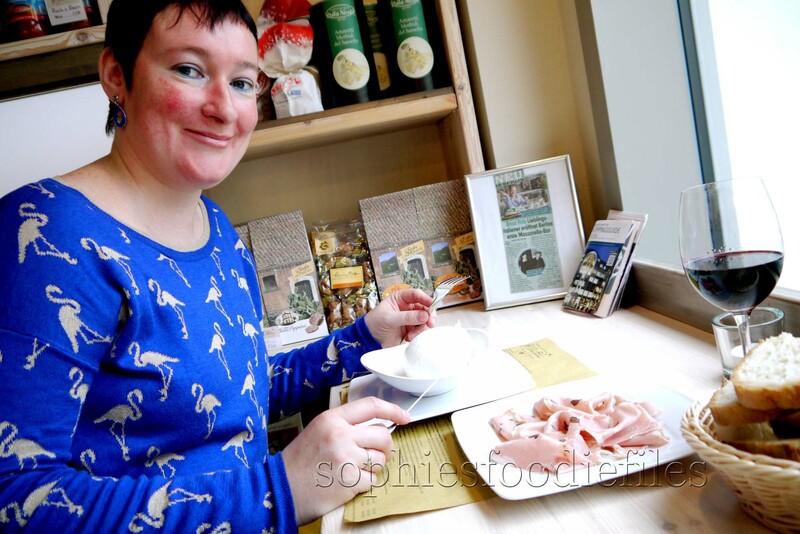 Mortadella is made out of low-fat pork meat, with black truffles in it. I ordered the same red wine because the waiter said this would go fine with my dishes. He was right! Peter ordered just finely sliced Speck: pancetta tesa, 100 gr. This is also finely sliced, made from pork meat from the pork’s neck, flavoured with salt & paprika. He ate this with the lovely bread slices & with that fruity olive oil. He also ordered another glass of his fine red wine. The place was filling up now. Me, enjoying some good food! 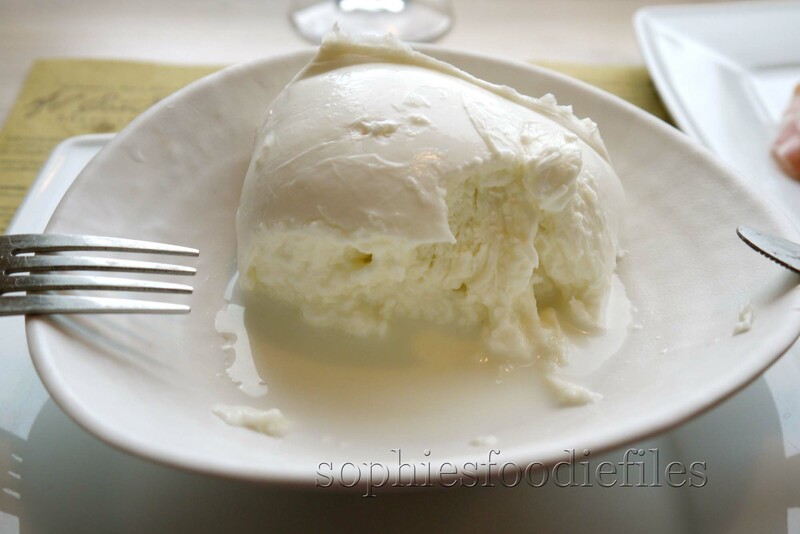 A lovely fresh Buffalo mozzarella: all for me! 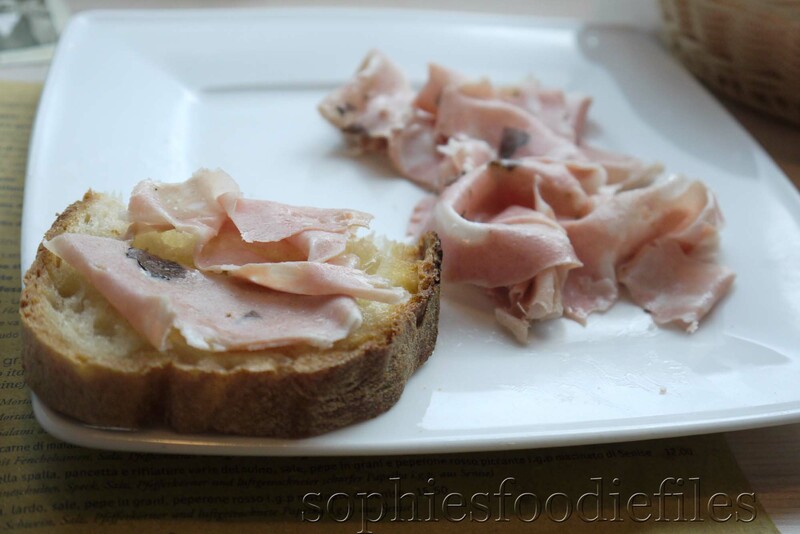 The finely sliced Mortadella with black truffle pieces in it! yummy! So rich & powerful in flavour: Heaven! The combo of the fresh white & creamy rich Buffalo mozzarella & the finely sliced Mortadella al Tartufe was a heavenly combo, I assure you that! And the red wine did go so well with it all! MMM! For the deal, we payed around 50€. 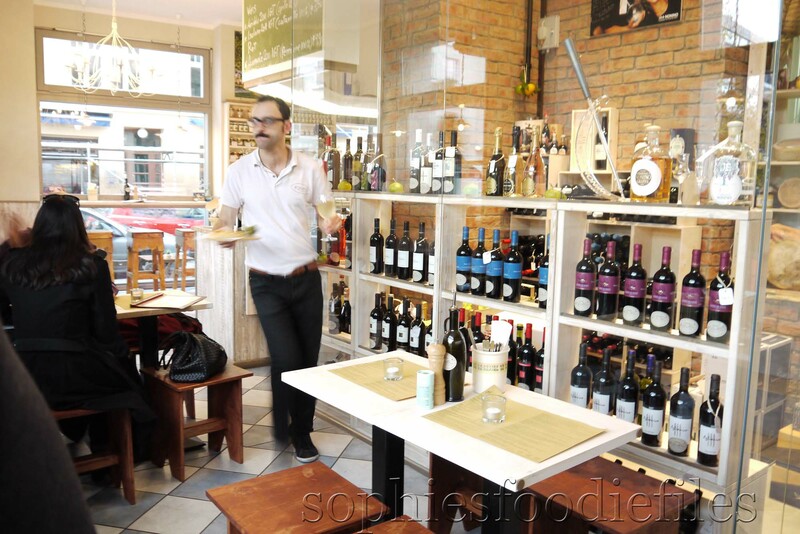 Our lovely waiter & the lovely interior of our mozzarella bar! Where I was sitting,I saw this article about this bar: Angelina & Brad Pitt came here too! We visited a lot of other tasty cafés & restaurants, but didn’t make any pictures. I will give you a few lovely adresses here extra though. Maybe, they will interest you. Just click onto their links in brown, to go to their websites. 1. Santa Maria, Mexican Diner, Oranienstraße 170, 10999 Berlin, Open? 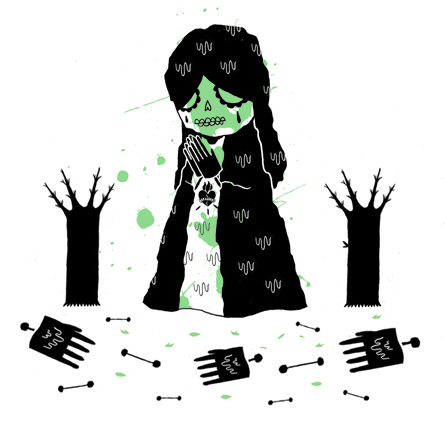 12.00-late, Mo.-So. | U1-bahn: Kottbusser Tor. This is a very alternative Mexican food resto. The atmosphere is a bit more dark & punky & but the food is excuisit! We took each a large filled burrito with black beans & the works! Mine was filled with soft beef strips, guacamole, mexican cheese, rice & crème fraîche & spicy red onions on the side. Peter had the same but with chickcen. Yummy! I had a Mexican beer with it! MMM! 2. Fleischerei, restaurant, Bar, grill. Schönhauser Allee 8, 10119 Berlin. It looks that you are sitting in a former slaughterhouse. Of course, you can eat meat dishes over here. They only sell 1 vegetarian dish, That’s all! 😉 Great atmosphere. Book your table in advance! We didn’t do that but still got a table at the window. You must book a table a few days in advance. Maybe if you are lucky, like us, you can get a table. We ate there twice. 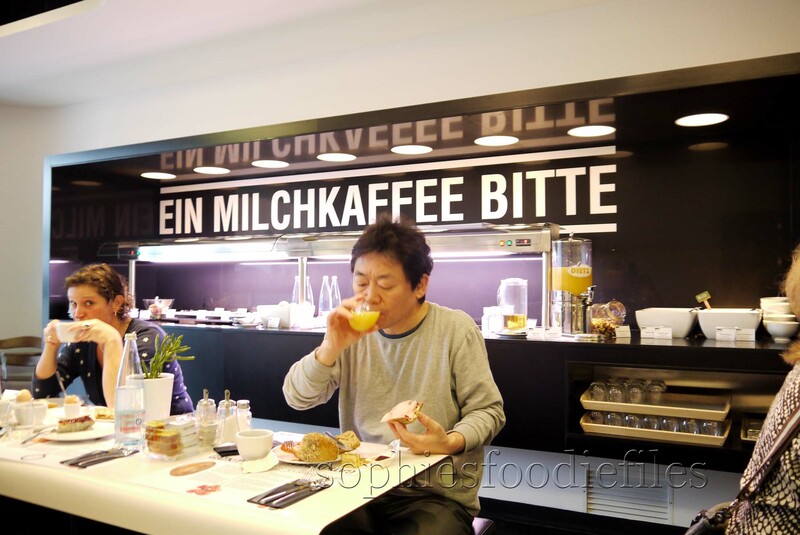 They have a German specialities. Once, Peter & I ate a half roasted duck in a lovely cranberry sauce with 2 special potatoes. Yummy! Very good quality too! Stay tuned, Subscribe by email through the link below to get my new cool newsletters aka posts! Join 1,850 email Subscribers! It is free! Previous Post A quick & easy pasta! oh my goodness! that bread looks so good! How come foreign bread looks 10x yummier than American bread?? When we lived in Spain, I heard that they grow a different type of wheat that makes that delicious bread– but was not that great for cakes and more tender baking. But you are so right– European bread is better (unless you can get La Brea bakery bread here). If it is like when my husband lived in Germany, many know English better than us 😉 My husband speaks both, on his last trip back a few years ago he barely used it! Looks like you ate some delicious bread on your trip! PS your flamingo sweater is awesome. Thanks for sharing, it’s interesting to read about your trip! Have a great day! Wow, Sophie!! Amazing food and activities! I’m terribly jealous 🙂 but it’s very fun seeing what you did on your vacation. 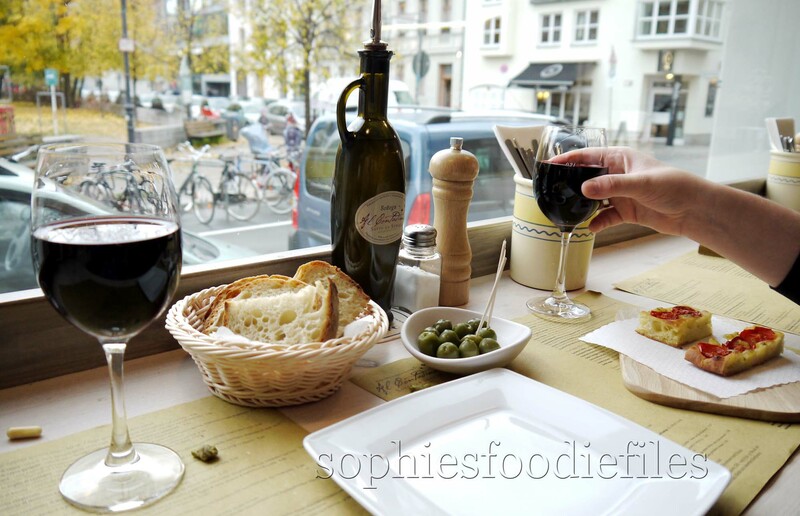 Love “traveling Sophie!” Great photos and yummy food. I love this feature. Please tell me more traveling adventures are in store! I loved this travelling post, too, Sophie! You describe everything in such detail and it’s so informative. I want to travel to Berlin now! 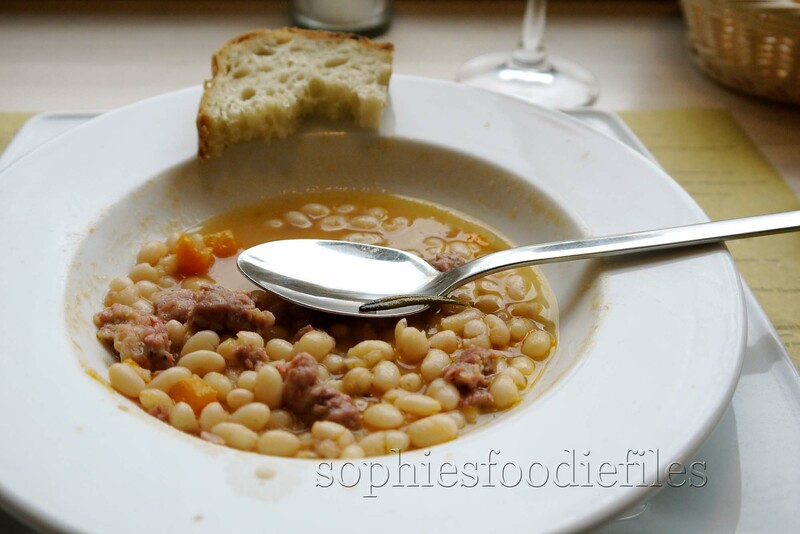 That soup, and bread, and olive oil, paired with such lovely wine sounds (and looks) amazing. 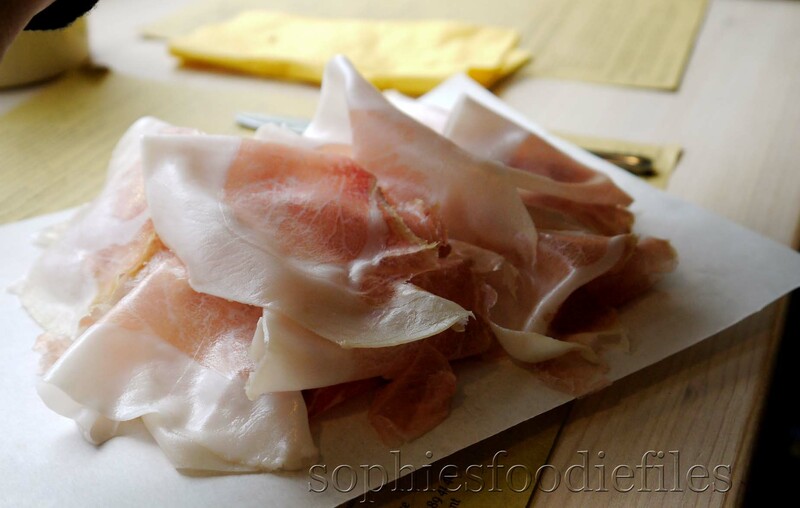 When I ate meat, I used to LOVE mortadella! I’ve not been to Berlin, but it is a city with a lot of history! All that food looks amazing…I want that mozarella ball now! And the mortadella! You can fly over & visit Berlin ! 🙂 Thanks! Wow Sophie…such an amazing trip you both have had. The food looks so so so good! Thanks, Ina! We loved it too! I don’t live there either! I l was travelling there! Sophie, it looks like you’ve had an amazing time! It’s fun to see these pictures, I’ve been to Germany but never Berlin. You must go there some day: such a cool & very modern city & a lot of history there too! Thanks, Tandy! 🙂 I just published Berlin: part 3! Perhaps someday I will have the opportunity to visit Berlin. Nice to see you without the sunglasses. 🙂 Some of the best part of travel is the good food! wow! Loved this post–another great one! I really wanted to get in on your breakfasts- sounded like so many yummy things to try! An I’ve never even heard of a mozarella bar! But it does sound like a terrific idea– kind of like Italian tapas! Thanks for sharing all the amazing things you saw and ate! Can’t wait to read part 3!